I was comfortably situated in the shade of a drooping cedar overlooking a waterhole in a low saddle between two timbered ridge tops. Fall-burnished oaks surrounded the muddy pond, which was rimmed with elk tracks and fresh wallows. I’d slipped into the stand two hours before, figuring there might be an elk bedded close in the cool, dense thickets. A light afternoon breeze had been swirling, but I knew it would settle and start drifting downhill within a couple of hours. Feeling the time was finally right, I started cow and calf calling, slowly increasing the volume and intensity. I’d just finished a run of excited mews and chirps when I caught a fleeting glimpse of brown drifting through the acorn-laden oaks on the uphill side of the waterhole. I figured I was about to get a shot at an elk and was more than a little surprised when a huge bear stepped out into the little meadow. I slowly fished a canister of potent pepper spray out of my pack, just in case, and chirped again. The bear started my way at a fast shamble. Opting to leave well enough alone, I didn’t make another sound. The humongous bruin stopped 20 yards away and then commenced pacing back and forth. Its hackles may not have been standing on end, but mine sure were. In the fall, bears spend 20 hours a day feeding to build up fat to carry them through the coming winter snooze. They eat about anything, and when they find a field of ripe grain or a heavy drop of acorns, they hang around scarfing up every smidgen. I’ve often joked that if someone made a call that sounded like ripe acorns dropping, he’d have the best bear call in the woods. A bear may come to investigate any sound it associates with food. Brown bears in parts of Alaska have learned that gunshots lead to gut piles, and hunters field dressing downed game have been mauled, even killed by these bears. A big old black bear can be just as predacious as any grizzly. Yogi may only want your picnic basket, but a real live black bears is very efficient at killing its own dinner. During spring calving season, bears follow the elk herds for miles, preying on the vulnerable newborn calves. These bears still come to elk cow and calf calling in the fall, but it’s a shame the bunny huggers have managed to convince most state wildlife agencies to close spring bear seasons. It might well be the optimum time to sucker a bear with a call. Bear calling is a different type of hunt, to be sure. I’ve seen bears respond on the double to a loud call heard more than a mile away. However, they have a very short attention span. When the sound stops, so does the bear, and if the pause is long, the bear simply loses interest and walks off. The old cliche “out of sight, out of mind” may be equated with “out of hearing, out of mind” when it comes to bears. This quirk is both bad and good for a hunter who would like to call in a bear. Bad in that it takes a lot of lung power to keep up the calling. Good in that it’s possible to call a bear within shooting range and then stop it right where you want it, by simply stopping the calling. One of my hunting clients was hot to take an elk and a bear with his bow, and he secured the necessary permits for both. Two mornings in a row, one of our guides saw different bears crossing a main road through an oakbrush valley. I figured there might be a road-killed critter or maybe an overabundance of acorns nearby. The following day, after the morning elk hunt. I took the hunter and his wife (also a client) to the area for a look. A medium-sized bear crossed the road right in front of us, so we pulled over and parked. We set up less than 100 yards off the road, with the husband posted 20 yards in front of me and the wife. Two minutes of intense calling brought the bear busting out of the brush 50 yards in front of us. I muffled the call but kept up the intensity until the bear was only 10 yards away. I quit calling, and, as hoped, the bruin stopped in its tracks. The instant it came to a full stop facing us, it took an arrow through the vitals. The bear made it about 30 yards before piling up and expiring. Hunting doesn’t get much more exciting than that. Bear country is big country, whether it be the dense woods of Canada, the high mountains of Colorado, the beaches of Alaska or the canyon country of Arizona. Scouting before setting up to call can improve your odds immeasurably. In the mountains and arid regions, water holes provide a major attraction for bears. Several years ago, I planned a fall bear calling hunt in Arizona with outfitter Tommy Freestone. The area we were to hunt was in the fifth year of intense drought, and, according to Tommy, the few water holes that remained were being hammered by the bears. Then, a week before our hunt, the area was inundated with record rainfall. Every waterhole filled to the brim; indeed, every rut in the road was full of water. Needless to say, our hunt didn’t pan out as planned. The bruins scattered, enjoying abundant and succulent new growth that suddenly blanketed a normally arid land. Five days of calling in 100-degree heat produced one small bear, and I passed on the shot. Two weeks later, after things had dried up a bit and the bears were somewhat back to normal patterns, my partner took a huge black bear near a water tank on an abandoned homestead. Where bear populations are high, sign may be found at just about any abundant source of food or water. But the bears may only be visiting at night, and you aren’t likely to call a bear across open country in broad daylight. Look for food and water close to or better yet in dense cover, and do your calling early in the morning or late in the evening. A bear’s hearing is phenomenal, and so is its sense of smell. Always call with the wind in your favor. Many so-called experts might have you believe a bear’s eyesight is poor. Don’t believe it. Keeping movement to a minimum is critical when calling bears. Extreme patience is another necessity. 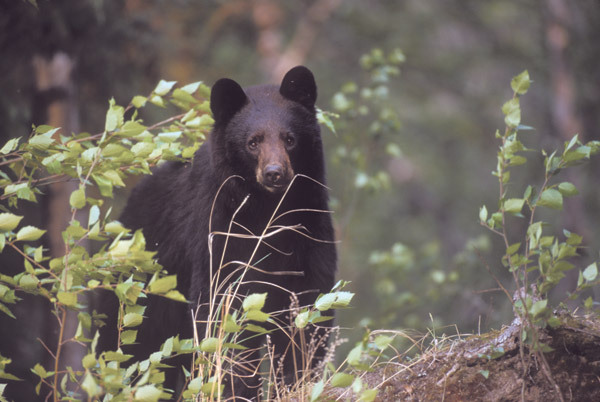 When I first started calling bears in Colorado, I blew a chance at a huge black when it sneaked within a few yards of me after I’d been calling for three hours and had kind of lost my focus. Take your time scouting, setting up, and calling. For bears, I prefer loud, hoarse calls that mimic a big-game critter in distress. But there are no hard and fast rules. I’ve used a mouse squeaker to entice a reticent bear those last few yards. I may mix in crow calls, as the black birds’ raucous racket often alerts a scavenging bear to an easy meal. When using an open-reed call, I may even throw in a coyote howl, just to keep things interesting. I have watched bears kick it into a higher gear when they thought a coyote might be getting to the goodies first. My favorite mouth calls are the Circe Triple Voice, Burnham’s Black Magic, Crit’r Call magnum, and Dan Thompson’s open-reed coyote howler. All are capable of volume and a wide range of sounds. Many hunters no doubt lose patience and quit before the bruin gets within sight. Although the occasional bear has responded to my intermittent elk calling, when actually trying to call a bear, I want to maintain continuous calling for an hour or more. Hunting with a partner is a good idea, as an extra set of lungs makes it easier to maintain continuous calling, and more eyes can better cover more country. Bears are unpredictable and should never be counted on to do what’s expected—especially when you’re trying to sound like lunch. Electronic callers are excellent for bear hunting, but not allowed most places. Before using an electronic caller, check all regulations regarding legality. With electronics, any volume can be maintained for as long as needed, and remote control lets you set up away from the call, out of a responding bear’s line of sight. Bear cub, bear cub distress, and sow bear sounds are not easily imitated with mouth calls yet readily available for digital electronic callers. No matter the type of call, anticipate an intense challenge. There’s nothing quite like suckering North America’s largest predator by sounding like its dinner.